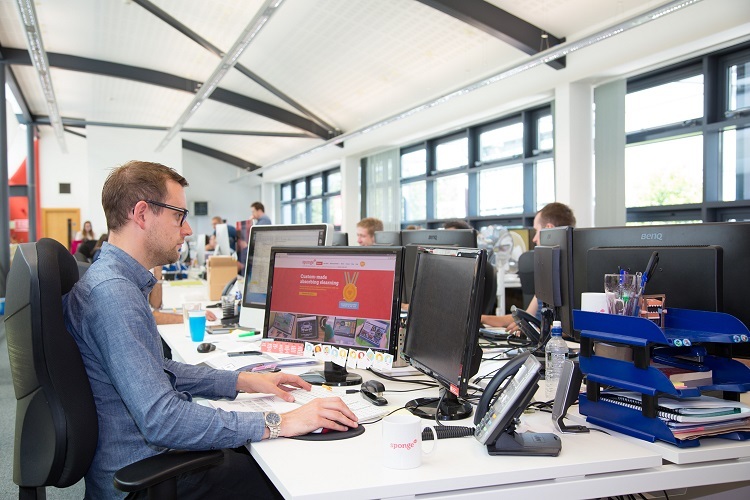 Supporting our design and build capabilities and solution-based consultancy is Comtec’s extensive selection of 24/7 managed IT services, delivered from our permanently engineer-staffed NOC. These managed services monitor and control your IT assets, and complement our maintenance and support offerings to deliver technology excellence and peace of mind to over-stretched IT departments. For Backup and Disaster Recovery Comtec propose a hybrid (onsite and cloud) based solution which will provide a robust and ultra-reliable system and provide the customer with the peace of mind that business critical functions will be available whatever happens, whenever it happens. Every day the operational servers will be backed up to a local Appliance in Reigate and from here the backup is replicated to the cloud, hosted at another Datacentre in the UK, this gives you both the speed of a local appliance alongside the resilience of the cloud (see Fig. 1). What does this mean for you if our Site becomes unavailable? 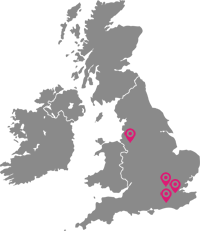 If the Reigate site were to become unavailable, the procedure will be to failover to your backups held securely offsite, as the cloud will remain available and rapidly accessible. The cloud will act as the platform for the systems and will on-demand run a virtual copy of them until you’re ready to restore the information back to replacement or repaired hardware. 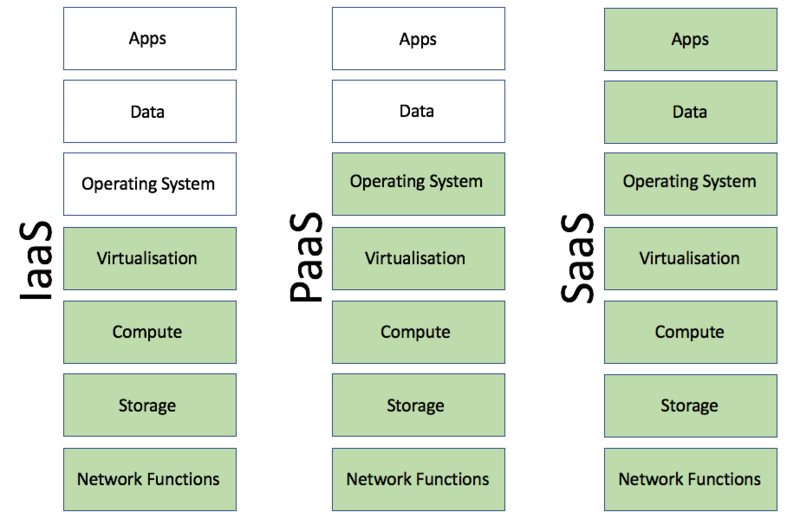 When the systems are run in the cloud there are a couple of options to connect you to them. Typically, a Virtual Private Network (VPN) for site-to-site which is used to connect an entire office to your now virtual systems or Point-to-Point (used to connect multiple end points i.e. Employees working from home to your now virtual systems. If the situation requires it, both options can be implemented; getting you up and running at speed. 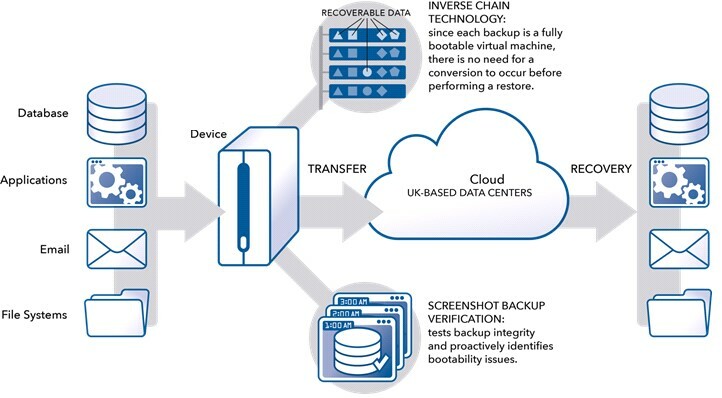 By using Inverse Chain Technology™, the backup process eliminates the area where most problems arise in the traditional backup process: the backup chain. The appliance takes data and converts it directly into a virtual machine each time a backup occurs. The most recent backup image is always the base image and does not rely on past incrementals to restore data. Since each backup is a fully bootable virtual machine, there is no need for a conversion to occur before performing a restore. With no complicated rollup or restore processes, data is always available immediately both on-site and off-site. A screenshot alert can then be sent directly to Comtec to confirm the backup. This is a unique feature of the solution. Each time a backup occurs data is saved in a universal virtual file format (VMDK). These backups are not dependent on previous snapshots allowing for freedom over changing retention and deleting snapshots without resetting the chain or dropping a new base image. Since each backup is a fully bootable virtual machine, there is no need for a conversion to occur before performing a restore. The backup and DR solution allows servers to be spun up in a couple of minutes giving a very short RTO. Because the solution uses incremental changes from snapshots it allows multiple backups to be performed during the day, shortening the RPO time down. The proposed solution caters for recovery from data loss, data corruption, local restore to point in time due to processing errors and disaster scenarios relating to loss of access to the Reigate datacentre.